Comments: please add anything you need to tell us, here. For physical deliveries, please include your Mobile Number. This enormously increases ease of delivery of your parcel. Thanks. One A4 Coloured Chart PDF 7 Shaped Light Language Grid - an individual configuration of sacred geometric shapes and colours - designed to help you to attract what you want in a specific area of your life - the light is installed in your Aura and you receive a copy of the Sacred Shape Geometry Grid configuration to put on your wall. Be guided to use Sacred Geometry to define the energies you want to experience in areas of your life like - my love relationship, my home, my job, my money, and so on. DELIVERY: Made to order. Your Light Language Grid is ready in 1-3 days, it is a form of healing that I am facilitating on your behalf, always 'in highest good', you will receive it by email shortly. 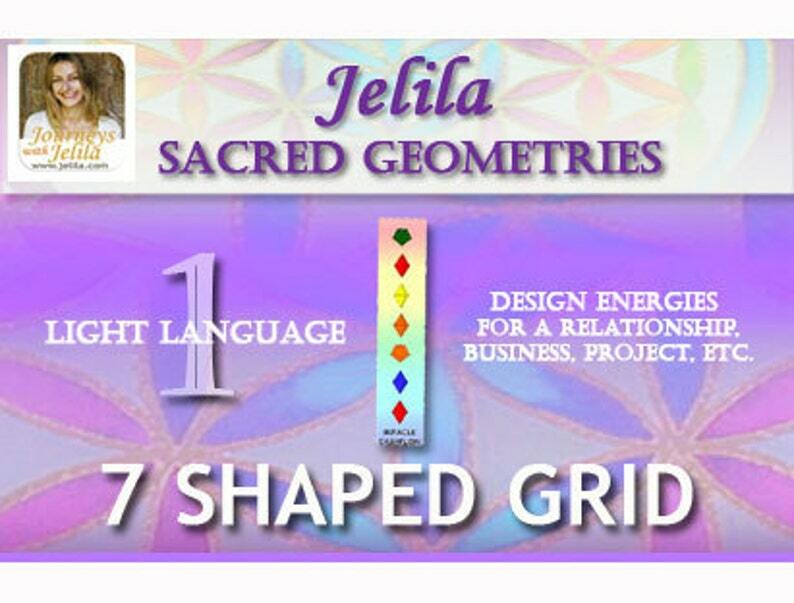 PERSONAL: Jelila writes the grid for you - a personal configuration of 7 Sacred Geometry shapes and colours arranged in a grid of 7 Sacred Geometric Shapes to help you achieve your goal. The energy is installed in your aura - it can help you hold an intention more firmly so that it can manifest - you receive the copy of your grid via email - you should print it out and pin on your wall - put it somewhere where you see it often but is fairly private - such as the back of a cupboard door. CERTIFIED: Jelila is a certified Advanced Light Language Practitioner who trained under Amana Virani. She completed an intensive course in sacred geometry Advanced Light Language in 2003, has written many grids, and is professionally certified to write Light Language Grids. GRIDS SHOWN: The Light Language grid shown here is a sample. Grids are entirely personal. GRID TITLE: Can be for any focused area - my relationship, my money, my home, my car, my project, etc. We define how you want it to be in your 20 minute consultation. DISCLAIMER: No medical results or results of any kind are claimed. Please see your doctor in case of any medical condition. For entertainment only. ORDER: Put the payment through now, and mention your phone and email in your order. Then I will contact you to arrange your Grid. I will then make your 7 Shaped Sacred Geometry Grid for you and send you a PDF file to keep on your wall. The positive energy is installed in your aura and becomes part of your charisma. Put your Grid where you can see it often, to reinforce the positivity. (c) Jelila 2012. All Rights Reserved. Disclaimer: No medical results or results of any kind are claimed. Felt energies immediately. Prompted me to make changes to overall life to love myself more (began new fitness and art program). Can tell this is from an experienced healer! Will patronize again. You can pay by Paypal or Credit Card, Etsy Voucher. or Transfer to my US$ or IDR (Rupiah) accounts in Indonesia. Please email jelila@jelila.com for Transfer Details. I can also email a Paypal payment request to you. GUARANTEE: my Crystal Healing Necklaces are GUARANTEED against breakage - if a Crystal Healing Necklace breaks, return it for free repair/replacement. You just pay the postage. If it breaks in the first month, postage is free. If a CD mp3 is faulty from the outset I will replace it (or send you an mp3 download) as long as you let me know within 5 days of arrival. Purchase is final however - sorry, I do not offer returns if you change your mind. ..and thank-you for buying my products! In case of any dissatisfaction with your purchase, please let me know straight away by emailing: jelila [!at] jelila.com and we will sort it out! My Healing Crystal Necklaces are guaranteed against breakage - simply return for repair or replacement. Jelila, PO Box 270, Ubud, Gianyar, Bali, Indonesia. Sessions can take place remotely, online, to book please email: jelila@jelila.com for an appointment. Delivery is by post from Bali, and takes approximately 14-21 days. There is a good postal service from Bali. Express mail is available, it takes 14 days. Please Join my Jelila Members Club online to stay informed!